Available for sale is Spectacular Spider-Man graded in 9.4 NM condition by CGC. Published in March of 1982, this issue features the first appearance of Cloak and Dagger. With Season 2 of the Cloak and Dagger TV Series set to hit Freeform in spring of 2019, you can expect demand (and prices) for this comic book to steadily increase. Grab this key bronze age comic today while you can! This slab is currently out of stock. Click here to find a copy for sale on eBay. Available for sale is Spider-Man: House of M #1 graded by CGC in 9.8 NM/M condition. This sketch cover variant was only sold at San Diego Comic Con and Wizard World Chicago in 2005. According to the CGC Census, only 24 copies of this variant have been graded in 9.8 condition, making it relatively difficult to come by. Grab this hot slab today while you can. This item is currently out of stock. Click here to find one on eBay! Available for sale is Marvel Movie Showcase Featuring Star Wars #1. Published in 1982, this issue reprints parts 1 and 2 of the Star Wars: A New Hope movie adaption that was originally published be Marvel Comics in 1977. 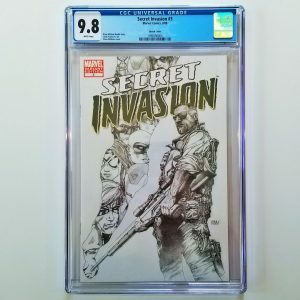 Graded by CGC in 8.5 VF+ condition, this comic is the perfect addition to your comic collection. In 2015, Marvel launched its new ongoing Star Wars comic series featuring the continuing (canon) adventures of our favorite original trilogy heroes. This variant cover of Star Wars #1 graded by CGC at 9.8 is perfect for any comic book collector. Available for sale is the eBay Exclusive Variant of Star Wars #38 graded in 9.4 NM Condition. 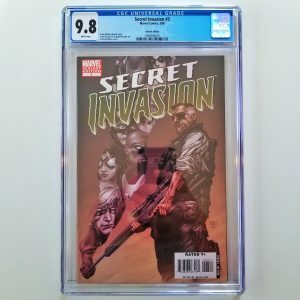 This limited edition comic was published by Marvel Comics in 2018 and distributed by Jesse James Comics to be sold exclusively on eBay. Only 2,500 issues of this variant cover were printed. The slab listed here recently sold via my eBay Store. Click here to find others like it! Available for sale is the eBay Exclusive Variant of Star Wars #38 graded in 9.8 NM/M Condition. 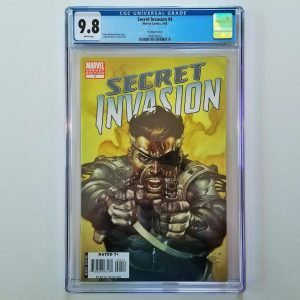 This limited edition comic was published by Marvel Comics in 2018 and distributed by Jesse James Comics to be sold exclusively on eBay. Only 2,500 issues of this variant cover were printed. According to the CGC Census, only 3 issues of this comic have been graded by CGC in 9.8 condition making this a hard to come by book in this grade. This slab recently sold via my eBay Store for $56.99 with free USPS Priority Shipping. Click here to find others like it! Relive the magic of Star Wars Episode IV: A New Hope in comic book format. With a cover featuring Luke Skywalker locked in a lightsaber battle with Darth Vader, this CGC 8.0 graded issue of Star Wars #6 is the perfect item for those who collect graded comics or Star Wars memorabilia. Available for sale is the Action Figure Variant of Star Wars: Mace Windu #1 graded in 9.8 NM/M Condition. According to the CGC Census, only 68 issues of this comic have been graded by CGC in 9.8 condition making this a hard to find comic in this grade. This slab is the perfect addition to any collector of graded comics or Star Wars memorabilia in general. Grab it today while you can! Available for sale is the Summer of Spider-Man Sampler #1 graded by CGC in 9.6 NM+ condition. This comic features a sneak-peek of Avenging Spider-Man #9 where we get our very first look at Carol Danvers as Captain Marvel. With the prices for Avenging Spider-Man #9 skyrocketing out of reach for many collectors, this comic is a great alternative for Captain Marvel fans who want to own a comic featuring her first appearance. This comic is currently out of stock. Find another one just like it on eBay! Available for sale is Tales to Astonish #93 featuring a classic Hulk vs. Silver Surfer showdown, graded by CGC in 7.5 VF- condition. This is the first comic that Silver Surfer appeared in outside of the Fantastic Four comics. Add this highly collectible, silver age beauty to your collection today! The slab listed here recently sold via my eBay Store. Click here to find another just like it! Teen Titans #12 featuring the first appearance of The Batman Who Laughs in NM condition. This comic was recently signed at the Emerald City Comic Con by artist Mirka Andolfo. Grab this hot modern key issue today while you can. There is only one available! This comic recently sold via eBay Auction. Click here to find another like it! Free USPS First Class Shipping! Available for sale is the John Tyler Christopher Trading Card Variant of Thanos #13 graded by CGC in 9.6 NM+ condition and featuring the first appearance of the Cosmic Ghost Rider. 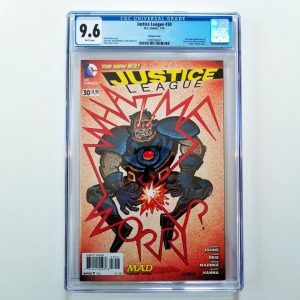 According to the CGC Census, there are only 45 copies of this issue graded 9.6 or higher, making it relatively hard to find this highly collectible slab! The graded comic listed here recently sold via my eBay Store. Click here to find others like it! Available for sale is the J.G. Jones Trade Dress Variant of Thanos #17 graded by CGC in 9.8 NM/M condition. Ready for immediate shipping, this cover is an homage to the classic Silver Surfer #4 cover and looks amazing. This variant had a print run of just 3,000 issues with currently only 28 being graded in 9.8 condition according to the CGC Census. Don’t miss your chance to add this awesome slab to your collection today! This graded comic is currently out of stock. Find one just like it on eBay today! Available for sale Thor #140 graded by CGC in 5.0 VG/F condition. This comic features the first appearance of the Growing Man. With a story by Stan Lee and cover art by Jack Kirby, this Silver Age classic is a must have key issue for any comic book collector. With only 217 total copies of this issue graded by CGC, here’s your chance to add this hard to find comic to your collection today! This comic recently sold via my eBay Store for $45 with free shipping. Click here to find another like it! Available for sale is Thor #337 graded by CGC in 9.0 VF/NM condition featuring the first appearance of Beta Ray Bill. 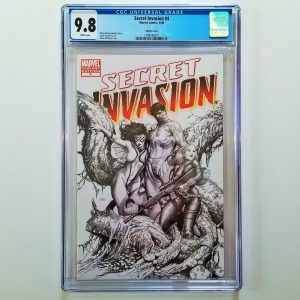 With one of the most iconic Marvel covers of the bronze age, this graded comic is the perfect addition to your comic collection. Grab it while you can, it won’t be here long! The slab listed here recently sold via my eBay Store. Click here to find another one just like it! Available for sale is Totally Awesome Hulk #22 that just came back from CGC graded in 9.6 NM+ condition. Featuring the first appearance of Weapon H, this comic has become one of the most sought after modern key issues. Don’t miss out on the chance to add this HOT comic to your collection today! The comic listed here is currently out of stock. Click here to find one just like it on eBay!